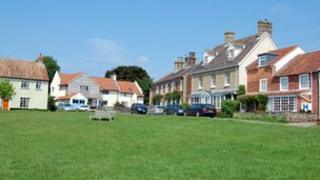 A village whose parish council resigned en masse has been boosted by help from Suffolk Coastal District Council. All five representatives of Walberswick Parish Council stood down last month in protest against the number of Freedom of Information requests received. At an extraordinary meeting, Suffolk Coastal voted to temporarily appoint Michael Gower, Stephen Burroughes and Peter Austin to the parish council. They will join David Webb, who was recently voted back on to the council. Mr Webb had stood down as chairman after more than 100 Freedom of Information requests were sent by a handful of local residents. He has since returned to fill a post left vacant by a death earlier in the year, but there was not enough time to organise the by-election to find replacements for the other six seats. Suffolk Coastal said the temporary appointments were made using the council's powers under the 1972 Local Government Act. Mr Gower is currently district councillor for Walberswick and Wenhaston, Mr Burroughes is councillor for Peasenhall, and Mr Austin lives in the parish and is a former district councillor.